Searching for the best of gas water heaters? Compare the tank-type heaters vs. tankless heating, and explore the main components, differences, and advantages. How it works. Who are the top manufacturers? Buying and sizing guide, installation and maintenance tips. Gas vs electric. Venting options. Combination type which is used for both heating the potable water and space. They can be either tank-type or tankless. Storage tank type is the most common in North America and gas water heaters the most popular type. The cold water is stored in the tank which can have the capacity from as low as 2 gallons to over 100 gallons. Heaters with the lower capacity, 20 gallons and less, are mainly designed for point-of-use service and a single application. Larger ones are built for the whole house use and those with the capacity from 50 to 80 gallons, are sufficient for families with 4-5 members. Tank-type models are mostly designed simple with an average energy efficiency, while there are some such as condensing that have ultra-high energy factors. Most of the available gas water heaters utilize natural gas, but if this fuel source is not available, the unit can be converted to use propane gas instead. Hot water is always ready in tank-type heaters. Even when there is no demand for hot water (i.e. the tap is open) tank-type heater must cycle periodically to maintain the set temperature. If the water temperature inside the heater's tank drops below the set value, the thermostat sends the signal to the gas control valve to open. Then, the pilot flame lights the gas combustion chamber and heats the water. When small draws are made, the gas burner does not usually fire. Cold water through the inlet pipe is coming into the tank, while the hot water rises up and through the outlet pipe goes to the open hot water tap. Products of gas combustion are, then, traveling through the venting system out, either naturally or forced by the blower. Selecting the right size of the gas water heater should be done by considering the family size and other factors. Keep in mind also that the tank has about 70% of usable space, so if you have a 50-gallon gas model, the tank can store 35 gallons. Tank-type and gas-powered water heaters can be found in sizes from 20 gallons to over 100 gallons. These heaters can be used in residential, commercial applications, and manufactured or mobile homes. The residential heater will usually be installed in a garage, attic, basement or technical room, but it depends on the room space and installation requirements. Tank-type gas hot water heaters cannot be installed in the bathroom or bedrooms and must be installed indoor as close as possible to the outside wall or chimney. Based on how flue gases are vented out, gas hot water heaters are designed as atmospheric, direct, power or power-direct vented units. They must be installed per codes and manufacturer's instructions. Each type is designed for different house type and location of the unit have to take into account the type. Atmospheric vented models are the most common type. The vent runs vertically, above the roof-line and are using the vertical standard B type vent or masonry chimney. Direct vented (DV) heaters do not use the electrically powered blower and chimney. They have a sealed combustion chamber and two pipes; one for extracting gases out and one for the air intake. Power vented (PV) units utilize a blower to move the flue gases out. This type is more flexible than the atmospheric vented heaters, as the vent can run vertically or horizontally and through the roof or the wall. The heater can also be at a certain distance from the termination point, but it is more expensive. Power direct vent models (PDV) are used in homes that lack sufficient air for gas combustion. Since the inside air cannot be used for combustion, the air is drawn from outside using the vent pipe while the electric blower moves the flue gases out. They are also used in homes that require flexible installation, such as when longer vents are required. The venting pipes can run either horizontally or vertically. The first three manufacturers from the above list are the largest manufacturers in North America while other manufacturers or brands are their subsidiaries or re-brands. Gas powered tankless water heaters in the last decade or so, are getting more and more on popularity. Their main advantages are an endless hot water, on-demand heating, small and compact size and wall mounted installation. Tankless gas water heaters can provide hot water for any home size or application, but it depends on the model and installation options. They can work as the single unit where some brands such as Noritz NRC111, can provide the high flow rate of 11 gallons per minute or work as the multi-system (some manufacturers offer features to connect up to 24 units into one system). Tankless heaters are also using natural gas and propane (LPG) gas as the tank-type. These on-demand units are more energy-efficient than conventional tank-type heaters, as they don't have a standby heat loss. They produce fewer greenhouse gases, and that is why they are called "green". More advanced gas water heaters are using condensing technology, which increases the energy efficiency to over 90% and provides great savings. Tankless water heaters are much smaller than the above tank-type and are usually mounted on the wall. Instead of heating water that is stored inside the tank, they use an on-demand technology that utilizes heat exchangers, so water is delivered in an endless supply when needed. Efficiency is much higher. Heat exchanger - most of the tankless heaters have one exchanger, while condensing have two. 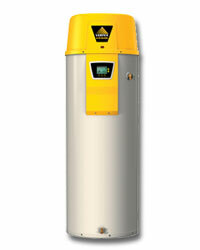 Water tank heaters are cheaper than the tankless and installation and venting costs are lower. Some tank-type units do not require electricity. Flow rates are higher on storage tanks. Tankless provides an endless and fresh supply of hot water. Advanced electronic system for the precise temperature control and diagnostics. Gas models are Energy Star compliant. Gas heaters have lower operating costs. Some gas models do not require electricity to operate. Electric models are simpler and cheaper. Electric units have lower installation costs. Electric has higher energy efficiency, but is not Energy Star. When you are choosing a gas water heater it is important to do proper sizing, so the unit meets the needs of a home and the family. The size of the water heater (capacity in gallons) depends on the number of people in your home and how many applications are to be used at the same time. Check the EnergyGuide label of the gas water heater to determine the first-hour rating. It is important to have this number higher to have enough hot water during the peak hour. The first-hour rating, FHR, is the measure of how much hot water the unit will deliver during the peak time. If your family counts for 1-2 people, a 40-gal unit is sufficient. For 3-5 people, choose a 50-gal unit and for more people select a water heater with 60 and more gallons. When searching for the gas water heaters, the recommendation is to look for the high energy factor - EF, Energy Star approved models and high first-hour delivery or water flow rate (GPM). They save energy, do the work efficiently and provide savings with the lower consumption, government grants, and utility company rebates. When comparing gas vs. electric, gas powered heaters are better solution as they heat water faster, have a higher recovery rate, costs less to operate and offer a wider line of products.